Salute to 100% waterproof stompers! Yessir, these pre-tested Boots are broken-in, comfortable and made for walkin’ without soggy wet feet. Take ’em through puddles, shallow streams, marsh, mud and more. Just like Swiss troops, you'll appreciate how this military-grade footwear defies water and glides over rugged terrain without a hitch. Set the pace, order yours ONLINE today! 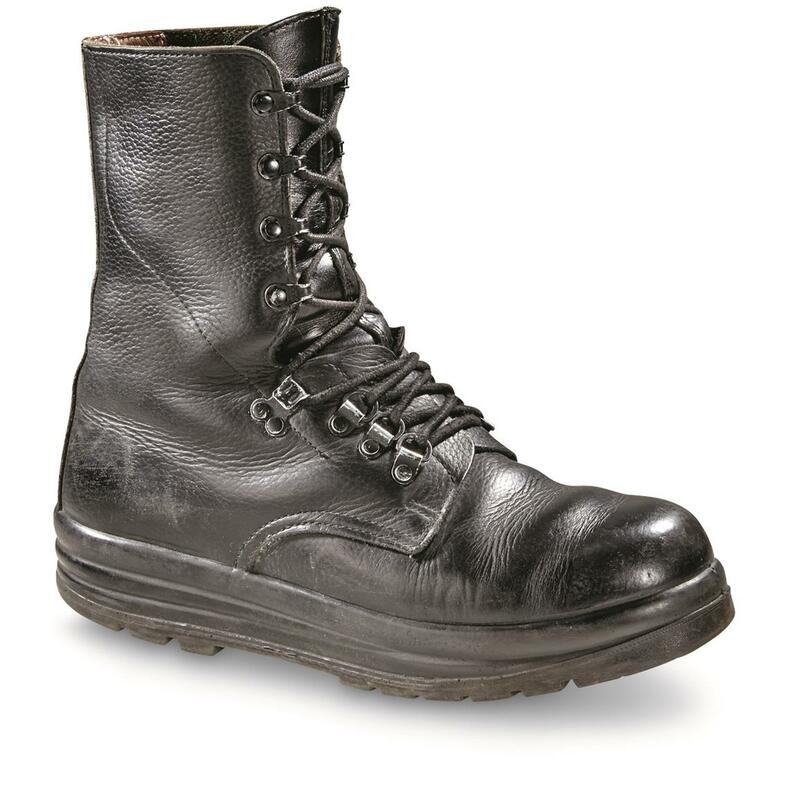 Swiss Military Surplus Waterproof Leather Combat Boots, Used is rated 4.2 out of 5 by 19. Rated 4 out of 5 by Aav amphibs from Nice boots too small Great quality workmanship, I really wanted this to work, but the medium width was too tight to work with. I ordered a size 11 and I bet I could have fit better into a size 12. But the width killed it. I need a wide size and they don't go that wide. If anyone at SG is listening, id be glad to get an exchange at size 12 length and WIDE TO EXTRA WIDTH. There seemed to be no way to check shoe size aside sticker on plastic bag. I called up for a return label as SG was very accommodating in the return. Boots headed back to Minnesota. Wow. Too bad. Nice boots. 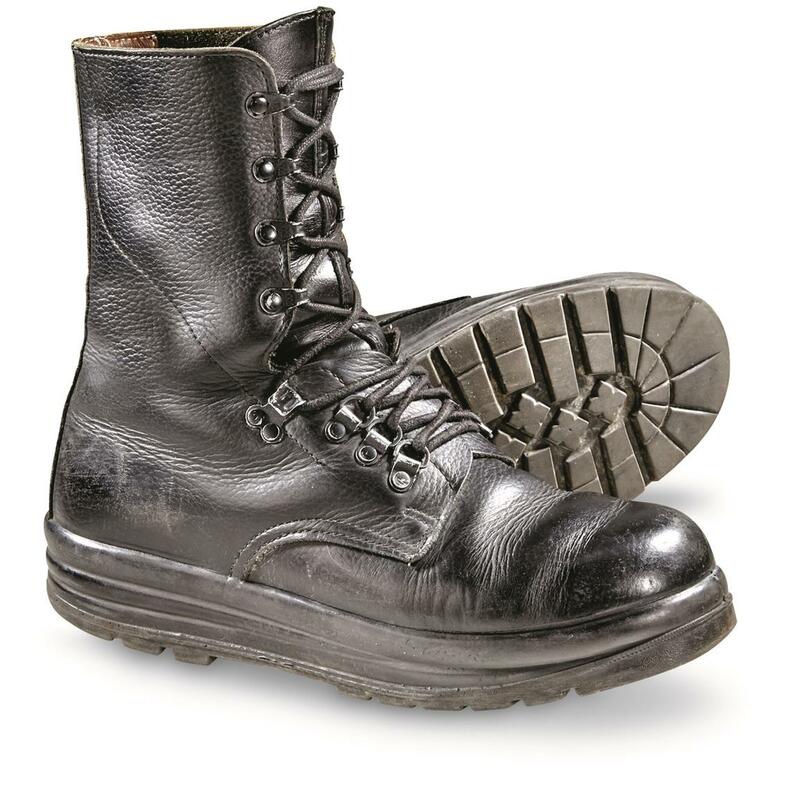 Rated 5 out of 5 by Les011 from Great Boots Update: I have used these boots for more than six months now. They are wearing really well. They are easy to put on and take off. I really like that about them. Very high quality leather. Wore them up a trail in the mountains through snow today and did really well. My go to boots. Best boots or shoes I've ever had. Rated 5 out of 5 by carrerawhaletail from 68 yrs old ,these fit amazingly great wore 15 hrs fit so good i dont want to scuff them up with work. Ill get another pair when i see my size again. Rated 5 out of 5 by philip from Better than expected out of the box I was looking for a pair of boots more suitable than my 20 year old tanker boots for outside snow and woods play. I figured at this price might as well give these a shot. I was expecting a pair closer to the photo on the product and was surprised to find only one small scuff mark on the toe area, other than that these things were basically brand new and even retained the new leather smell. The leather is nice and supple so very little breaking in required (unlike many top dollar brands made here in the US I've owned over the years). Mine came with the original paper thin insoles which i immediately replaced with my preferred style, and superb laces. Expecting from previous reviews to run slightly small I ordered the next half size up and these fit perfectly. They are a little tight when wearing thicker winter socks but i expect the leather to stretch a little over time. Rated 5 out of 5 by Les00 from Fantastic Boots I bought a number of pairs of these boots because I like them so much. They fit well for me and are very solidly built and very comfortable. The leather used is heavy and high quality. I believe the review where the reviewer said the sole came apart. I have had no such problems but they are used and some will be better than others. I got one pair that was not in really good shape. It needed to be shined and was more worn. The others were in not like new condition but the leather was soft and shined and the soles not worn very much. I'm embarrassed to say I bought six pair I liked them so much.should last me many years. I could see these selling for $160 new easy. Rated 1 out of 5 by bratry from Beware I ordered a size 10 which is what I normally wear. They were in great condition and seemed to be of very high quality. They were very tight on the width and the length was barely enough, certainly not enough room for better insoles. So, I ordered a size 11 and they seemed to fit ok. After only about 4 or 5 days of wearing the size 11 boot the foam\rubber between the boot and the rubber sole began to crack terribly and crumble like it was dry rotted and the soles started to fall off. I returned both pairs.